Hi Everyone!!! It's Gloria from the Olde Green Cupboard !! I know... you are all taking deep breaths due to surprise!! I thought it was about time to post information on my blog again! I'm going to try to be much better at keeping up-to-date with the Olde Green Cupboard life...and mine!! Many people have always wondered what my house and sewing studio looks like...so now that I've finally figured out how to move my camera photos to my computer...I'm a happy girl! 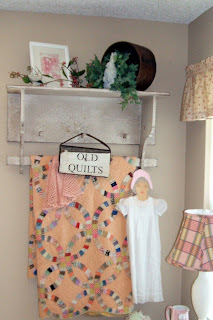 I simply LOVE quilt racks with shelves and pegs...! The quilt hanging is an antique double wedding ring. LOVE IT!! 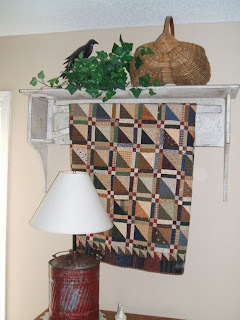 The Old Quilt sign is made from an old house board and attached to the top is an old leather bridal ! We found these in Pennsylvania! Also is an antique child's dress. This is my bedroom - Shabby Chic!! Here's another one of my favorite peg racks! It's a dark burgundy... and of course...another one of my loves are CROWS! Don't ask me why... I just love them...I can even "crow" like one (I can't believe I just told you that...! 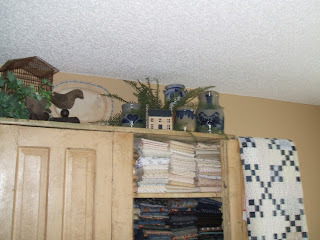 )I'm getting ready to find 4 of my primitive quilts and tie the end into a bundle and hang them from the pegs! Plus... I need to add a little greenery to soften up the display! 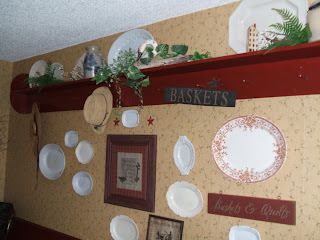 This is another wall in the dining room. Don't you love my quilts? They were both given to me for Christmas presents from the girls at the OGC!! 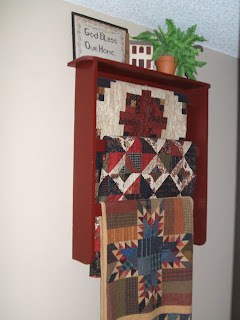 I love this particular quilt rack. It actually swings out to the left so it's easier to hang your quilt. Once it's hanging just like you want... simply swing it back under the shelf. We had these years ago in the store.... they are wonderful and unfortunately we have been unable to locate the vendor we ordered them from a show in Pennsylvania. 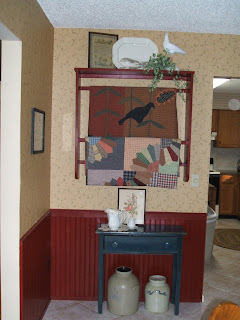 The quilt hanging is Spaghetti For A Crowd by Country Threads... one of my favorites!! This is in my hallway once you've walked through the front door. 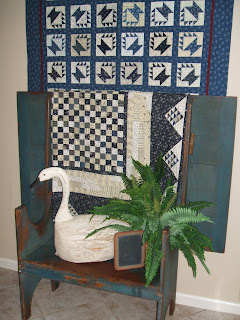 The quilt hanging on the bottom was made for me by Carolyn Allen... 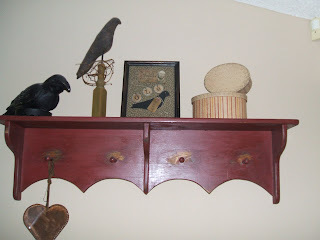 It's a Primitive Pieces by Lynda pattern... LOVE IT!! By the way... all of the burgundy quilt shelves and racks were made for me by my honey...Jack!! He's such a good guy....I'm so happy he's mine! Okay...now we're getting closer to my sewing studio. This is in the small foyer area just outside my studio door...! My bench/flip table was given to me by my sister - Vicky. (I'm hoping she will not want it returned in the near future...) Sitting on top of the bench is a LARGE carved goose. I can remember my granddaughter - Elizabeth - would ride it like a horse when she was just a little tike... such a cutie she is! Hanging over the bench is a pride and joy quilt that my daughter - Heather - made for me one Christmas. And then my awesome basket quilt on the wall was given to me in a quilt exchange from Carolyn Allen. Can you tell they know I love blue and white? We are now in the sewing studio! Ok..I'll admit I have a collection problem!! 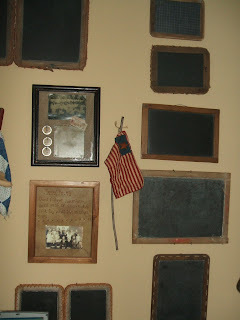 This collection is antique children's chalk boards. I simply love them. I have one that still has the lead pencil piece tied to it! Another one with lines etched into the slate so they can learn music notes, one with a paper insert that shows the alphabet... I wish they could talk to me... I'd love to know about the little girl or boy that learned how to read and write from their work. Here's another idea I saw in a magazine!!! While antiquing... look for OLD wooden folding tape measuring sticks. 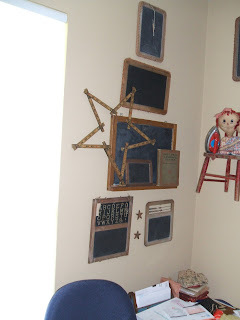 Shape them into a star and hang them on your wall... or sit them in with other collectibles on a shelf. My "First Year Language Reader" I purchased at an antique shop. It was published in 1911 and belonged to Mariaretta Carpenter. How sweet is that? This is a portion of the top of my large antique yellow (it looks white doesn't it?) cabinet. I'll never forget the first time I saw it. We were coming home from a show and we stopped to look in this new antique shop. There it was...it took my breath away when I first saw it... what an awesome feeling that is...know what I mean? It was a bit on the "pricey" side so I called my Jack to see if it was ok... of course he said... "if you love it..it's okay with me" (see I told you he was wonderful). So... I paid the cashier and off we left for home...! Jack would drive back and pick it up with the truck in a few days. When returning home with my beloved cabinet...he said to me "honey, I can't believe you bou ght this...it's so old!" Sometimes they just don't understand primitive lovers to they? But... he moved it into my sewing studio and I filled it with my fabulous fabric! Look at my quilt on the door....I LOVE IT! One of my gals... Susan Ache... made it for me! I'll show you the entire cabinet in another message... along with a photo of my walk-in closet stash (e-e-e-e-e-e-k) and my hall closet stash... (more e-e-e-e-e-e-k)!! And last but not least... 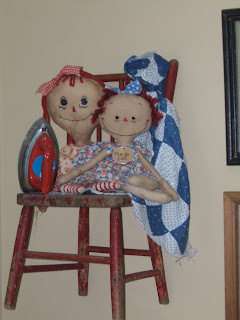 I love adorable, vintage Raggedy Annie dolls... Don't they just make you grin when you look at them? They sit in an antique child's chair right by my sewing machine and TV. I can look at them a million times while sewing and they still make me happy! Well, I feel like I've accomplished a major project. Learning how to BLOG in the modern age. Of course I've been working on this for over 3 hours! I surely hope I get faster...heck I could of almost had a quilt pieced in this time frame! Have a wonderful week everyone.... come in to The Olde Green Cupboard this week and enjoy the 25% fabric sale. It lasts until July 11!!! We have our new schedule out... Heather is in the process of getting the website updated! We have a special for all of you that shop our website!! 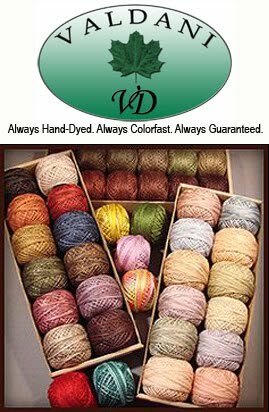 With any purchase you will receive a FREE Olde Green Cupboard pattern of "Only A Few Hours!" This quilt is fat quarter friendly and goes together... "in just a few hours". Thanks for shopping with us! Happy sewing, stitching, appliqueing, piecing...you name it....Happy Everything!